The sky was perfectly blue without even the slightest interference of cloud and the earth was uneven with seemingly barren hills, yet there was evidence that nomadic peoples have stopped along this route. In the foreground short plants that are destined to become tumble weeds and occasional trees are sprinkled throughout this Biblical location. 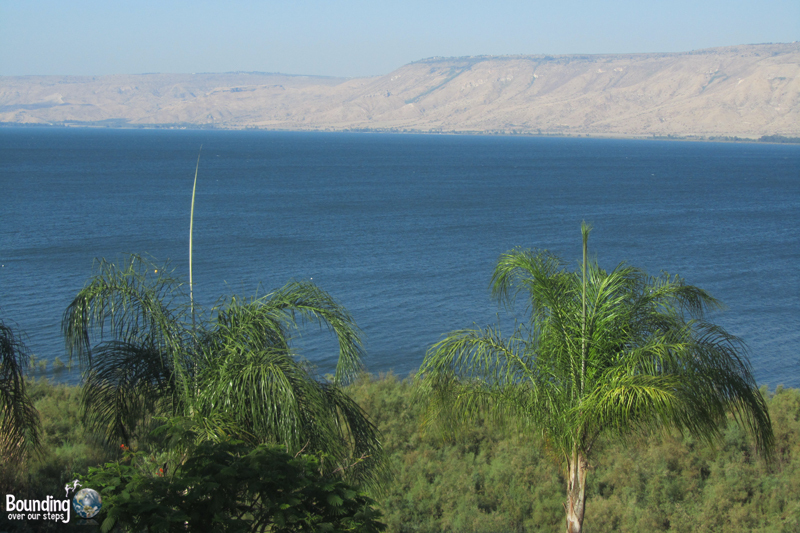 Our first view of the Sea of Galilee, also known as Lake Kinneret, was breath-taking! Coming from the north we arrived at a high position overlooking the lake with a backdrop of the pale Syrian mountains that had subtle purplish hues to them, making both the sky and water a deep rich blue color that sparkled in the sunlight. It was easy to see why Jesus had spent so much time here. 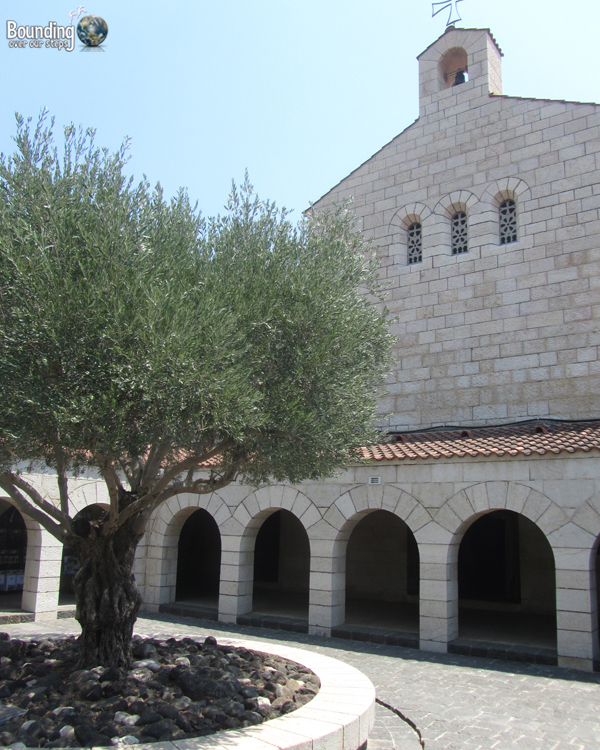 We began our historical journey around the lake on the northern shore in Tabgha at the Church of the Beatitudes. 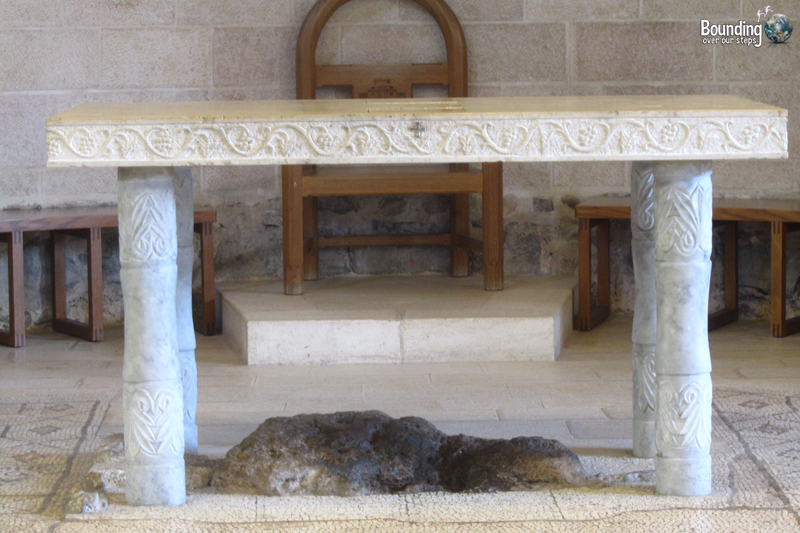 This is where Jesus is said to have given his famous Sermon on the Mount speech. It is now a very modern-looking location with a Roman Catholic church built in 1938, several other buildings, walkways and even a huge parking lot with spaces for big tour buses. We decided to recite the speech on this hallowed ground. 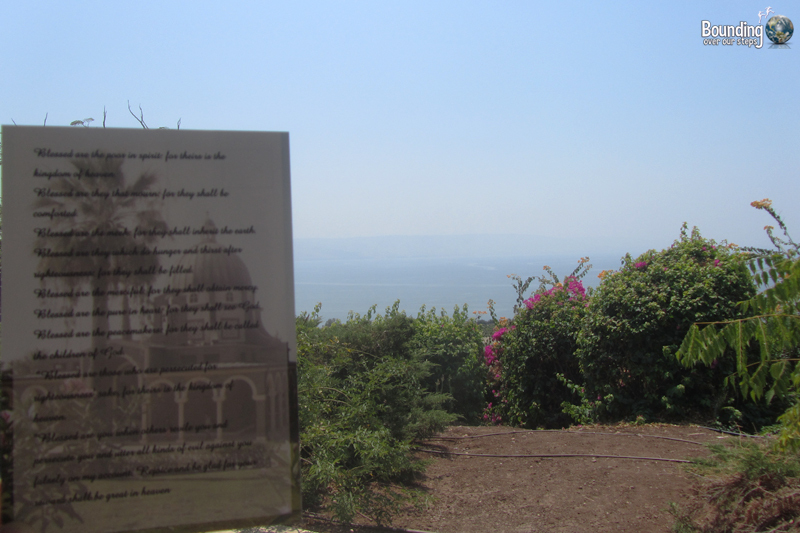 A very friendly nun gave us a postcard with the Beatitudes on it (she had them in many different languages) and we went in search of the perfect location overlooking the lake, which surprisingly proved a bit difficult due to the landscaping that had been done. Much to our surprise it turned out that the best view was from the parking lot so we stood and read each of the eight Beatitudes, giving time to ponder each one as we gazed out over the pale blue water and the Syrian mountains. The view was extraordinary. Only a short distance south is a church built in the 1980s with this very long-winded name (it works much better in the original German – Brotvermehrungskirche). As the name suggest this is reportedly the location that Jesus fed 5000 followers with only five loaves of bread and two fish, but it also has the remains of the Byzantine basilica that was built on this site in the 5th century. 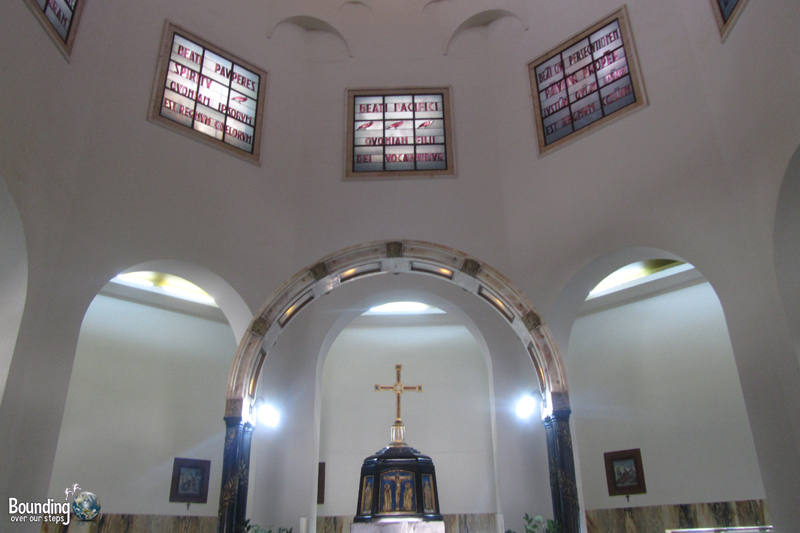 We became angry while visiting this holy site because people were selling postcards and souvenirs inside the church. We do not claim to be experts in Christianity, however we do remember learning that Jesus was very much against selling things in “his father’s house”. 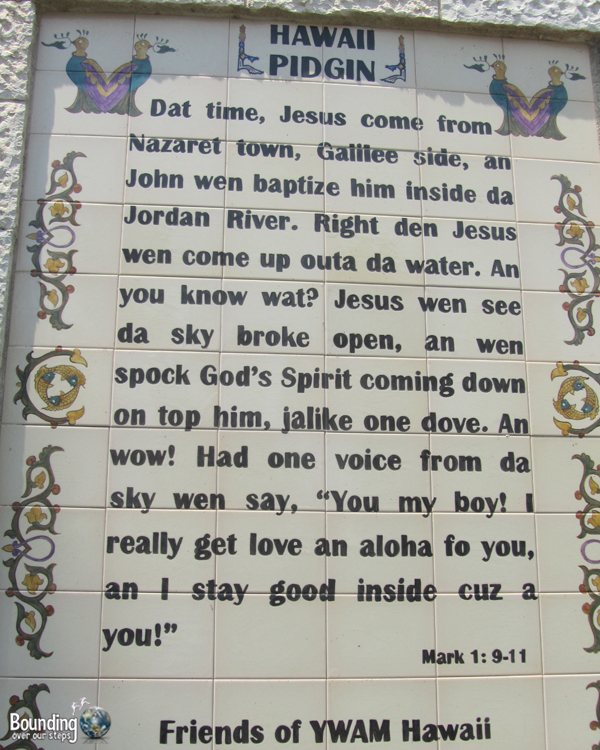 And so we found this rather hypocritical, especially in the very location that he gave his sermons. Little did we know that this was nothing in comparison to what we had in store at the Baptism Site, that we were to visit next. With the church behind us, we walked the very short distance towards the lake, where we came across the most interesting looking animal sitting right on top of the stone alter of what looked like an outdoor makeshift church. 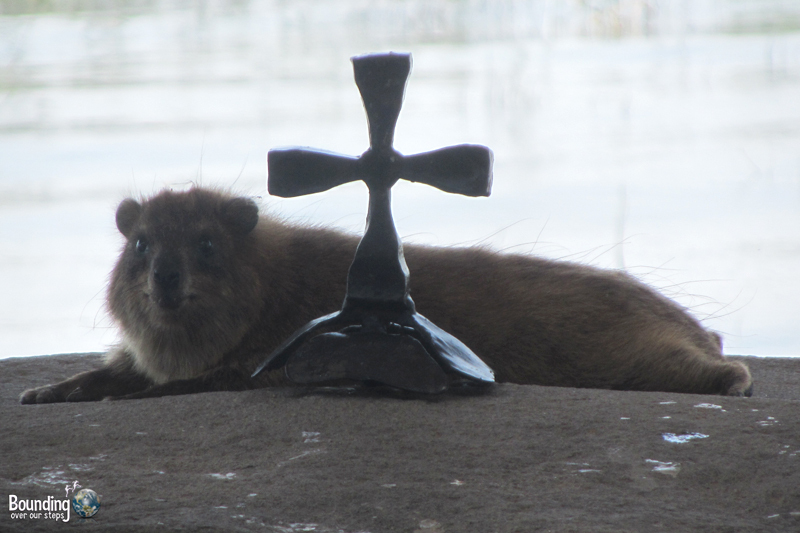 We had never seen this furry “beaver-like” creature before and we found ourselves mesmerized as it jumped off the alter and explored the surrounding rocks. We looked it up later and it turns out that it was a rock hyrax. At the very southern end of the lake lies the Jordan River where Jesus was reportedly baptized by John the Baptist. As one could imagine Christians come from long distances to get baptized at this holy site. We parked our rental car in the large lot and walked towards the building that had been constructed next to the river. We enjoyed looking at the various languages scripture had been translated into that were displayed on the walls leading into the location. 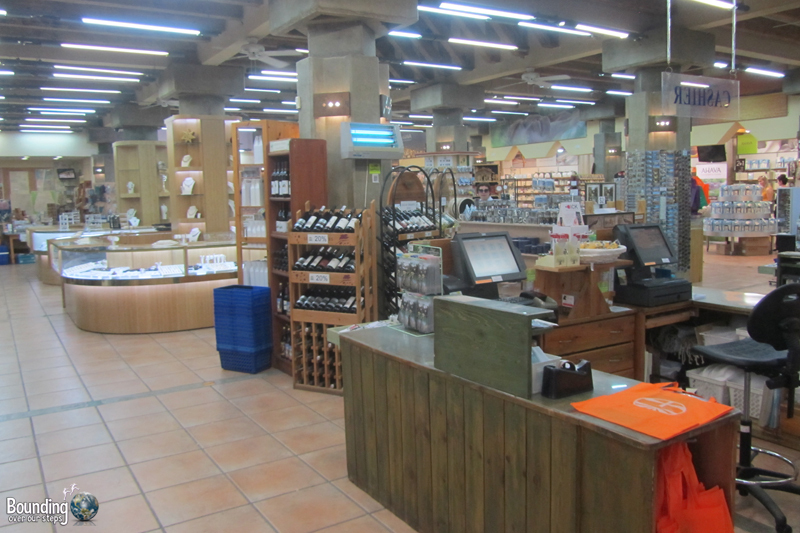 We became very disappointed and even a bit horrified as we entered to find a restaurant and mini-mall. While some of the items sold made sense for this site, such as white baptismal robes and sandals, we left sickened that items, such as jewelry and cheap souvenirs, were for sale, so obviously exploiting and capitalizing on the popularity of a sacred religious site. 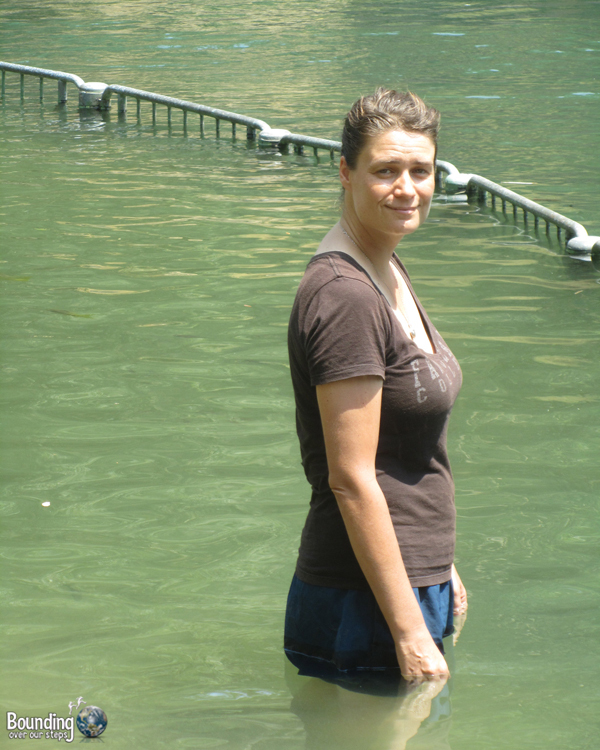 The highlight of the visit to Yardenit was standing in the water. With the kitsch of capitalism behind us, we simply enjoyed the narrow river while looking at the greenery on the opposite bank. Small fish nipped at our feet and legs and during our visit, a small group of musicians were singing and playing the guitar quietly and peacefully not far away. It was quite lovely. It seemed strange, on our last morning after experiencing such a religiously-significant visit to the Sea of Galilee, to see people boating and water-skiing on “Jesus’ Lake”. We suddenly realized that this was more than a famous historical site; it was also simply a beautiful lake to enjoy. So, we made sure to spend our last morning there simply enjoying Lake Kinneret just for being a beautiful location. We swam and even took a short nap on the beach. Still, we couldn’t help but wonder which rocks Jesus might have touched while he was there or if he had swum where we were swimming. 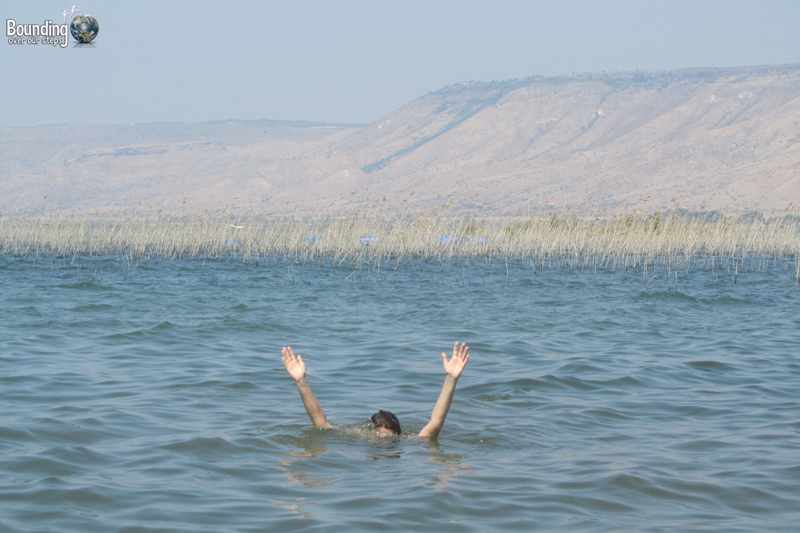 And of course we couldn’t leave the Sea of Galilee before trying to walk on water like Jesus. But as you can see, it didn’t go very well. What hallowed ground have you visited? Sounds like an interesting time, so glad you enjoyed it. There are so many places I have visited where they cash in on the commercialism of historic sites. I can understand why it would bother you. I’m bummed I missed this when I was in Israel. Perhaps next time! The great thing about traveling so much is that there is usually a “next time”. It’s not far from Tel Aviv or Haifa so if you rented a car you could easily make a nice weekend trip to the Sea of Galilee. It was so surreal seeing people water-ski on such a historical body of water, so be sure just to enjoy it for being beautiful as well. 🙂 We stayed at the Kinneret Kibbutz in the south of the island and it had really nice views of the lake. I WANT TO FOLLOW THE TRAIL YOUR GOING DOWN AND SWIM IN THE SAME WATER, BUT FOR NOW I WILL FOLLOW THROUGH YOUR EYES. WE HAVE OUR WINTER NATIONALS THIS COMING WEEK ARE YOU UP FOR A LITTLE UMPIRING.?? HOW WERE THE UMPS IN THE GAME YOU PLAYED LAST YEAR?? Looks like we will have to add this place to the list when we head to Israel. That animal looks like a camel made love to a guinea pig. I would have stared at it too!